I'm excited to announce that the House has passed my bill to create a state-wide police training program on children with autism who wander. The legislation will create a police training program on best practices for locating and communicating with autistic children who have gone missing. HB 6260 is based on Logan’s Project in Cheshire, which I created after hearing about Logan Gibbons, a 16-year old autistic boy from Southington with a history of wandering away from home. Logan and his family testified in favor of the bill in front of the Public Safety and Security Committee in February. Many children with autism spectrum disorder attempt to wander from a safe, supervised space. Known as elopement, autistic children engage in this behavior at a rate much higher than their peers and often wander towards water, leading to higher rates of death by drowning for autistic children. 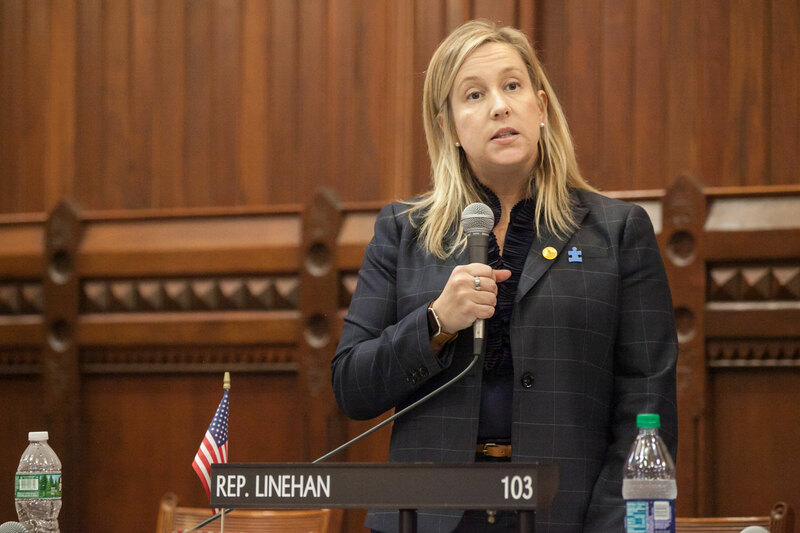 Logan’s Project in Cheshire has been very successful in providing police training on this issue, and this bill would make it a resource available state-wide. It’s for the safety of children with autism – who often don’t respond to traditional search techniques – and to provide our police officers with another tool at their disposal. The Gibbons have been incredible advocates for this training, taking what is truly a terrifying experience for any parent and using their story to help other families.